1. In a mid-1800s essay Nelson W. Clapp compares Montgomery’s topography to what household item? 2. Ithiel Town was a civil engineer who designed and built many early buildings and structures. He patented the Town lattice truss in 1820 which made him wealthy. How much did he charge for those who used his design? 3. What State capital did Town design? 4. How many of Montgomery's covered bridges currently span the Trout River? In September of last year, after years of work by many local people, the U.S.Congress made it official and approved the national Wild and Scenic River designation for the Upper Missisquoi and Trout Rivers. This required an extensive study justifying the designation and approval by the abutting Towns. The Society played a minor role answering questions about the history of our area, and reviewing / providing written input for the nomination. We also hosted one of their meetings at Pratt Hall. and / or owe its location or existence to the river. ORVs are recreational (fishing, canoing, hunting, sightseeing...), historical/cultural, scenic/aesthetic, or natural history (wildlife, plants, water quality, geology...)." Montgomery's covered bridges were among the ORVs which helped qualify The Trout River for the designation. Once the designation was approved an advisory committee made up of representatives from each Town was formed. One of their missions is to sponsor events that promote a better understanding of the rivers. They requested we host an event and present a program on our covered bridges. We agreed and invited the Covered Bridges Garden Club, the Hectorville Bridge Committee, and Montgomery Conservation Commission to join in. 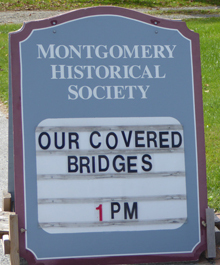 On Oct 4th about 50-60 people attended the event at Pratt Hall which included short pitches from each group and our presentation on the history of Montgomery's covered bridges. 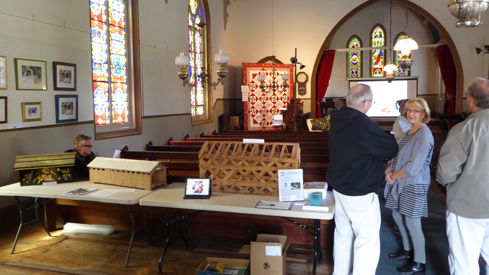 The Hall was decorated with covered bridge models donated by the elementary school, paintings, a quilt, and we re-designed and printed new pamphlets with maps which we provided to all. We were honored to have several Jewett family descendants there too who added a personal touch to the discussions. Attendees were then encouraged to tour the bridges and enjoy the beautiful day. Sweets were provided by "Sam" Murphy and fresh cider was served. A copy of the presentation is available on our web site as well as the updated pamphlet / map. We've also added a Google map with the bridges plotted and GPS coordinates to assist people navigating with mobile devices. The pamphlet and Google map links are on our Home Page. Our thanks to all involved and to all of you for your continued support. Great news just in! The MHS will be receiving an Award of Excellence for the West Wall Capital Campaign and Restoration Project from the Vermont Historical Society and League of Local Historical Societies and Museums; and Lutz and Elsie Saborowski have been selected to receive Lifetime Achievement Awards too. The awards will be presented October 30 at the LLHSM Annual Meeting in Burlington. Pictures in the next newsletter. Congratulations to Lutz and Elsie, Tim Chapin, and the entire Board for these well deserved honors. These are the 11th and 12th awards the Society and its members have received since 2007. The MHS teamed with the Friends of the Montgomery Library to bring the Woods Tea Company to Pratt Hall in August. Kudos to Pat Farmer for pulling together this first public event since completion of the West Wall project. American traditional and Folk songs, including "Sink the Cheerio", kept our toes tapping and smiles on our faces. Work will begin this month on a new chancel roof . The asphalt shingles will be replaced with corrugated steel to match the standing seam roof on the nave. Work should be complete by November. Next year we hope to have the exterior of the West Wall prepped and painted and also repairs made to the bell stage and clock face moldings. Author Misty Angelini and her photographer spent time with us in July touring Pratt Hall as part of her research for a book on "Historic Vermont Churches". These fearless women crawled around the crawl space and climbed up the tower to get the full experience. We also gave them a few tips on other area churches, including the former Congregationalist (Town Hall) and Baptist churches in the Center. No idea yet on a publishing date. Our second ever tax return was filed recently. It included a Vermont filing this time around and cost us $1,200 (after a discount!) Ouch! You can designate us to receive a donation from Amazon anytime you purchase something. Amazon will donate half of one percent of the purchase price to the MHS. This works out to 50 cents for every $100 spent. This costs you nothing. Amazon donates it from a foundation funded by its profits and vendor contributions. You must enter the Amazon website via www.smile.amazon.com using your normal Amazon ID and password. After you sign in the first time you will be asked to pick a charity/non-profit. There are several Montgomery Historical Societies so please make sure to pick us in Vermont! You can change your pick at any time. You can also enter via the link on our homepage. We've always wondered if what we know as Pratt Hall today is what was originally there in 1835. We've suspected another smaller building might have been there based on what appears to be an earlier foundation inside the current nave foundation. Artifacts in the tower also indicate our pointed lancet front door was a later addition. Church records indicate it was closed for 2 1/2 years for major renovations in the 1870s. 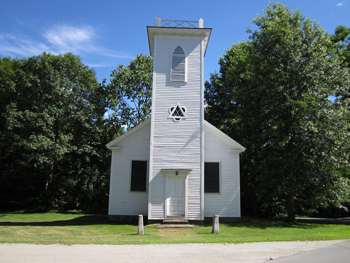 In researching the life of Joel Clapp we discovered the Episcopal church in Royalton where he served as pastor for a time, was completed in 1837 and was also consecrated by Bishop Hopkins. Could this be what our building looked like at one time? Might Montgomery's Episcopalians have expanded the nave and recycled the tower? We had a great response to our reminder letter we sent out in August. It's never too late to join. Please help us reach our goal of 200 members for 2015. If you've already joined - thank you! If not, it's never too late. Now that the Hall is back together we are planning on our normal Christmas festivities. A member appreciation open house and Candles and Carols will be the third weekend of December. We will provide details as soon as we nail them down. We recently added a new projection screen, audio receiver, and laptop to our equipment inventory. The older pieces, donations and rummage sale finds, finally wore out. We need to replace the hand microphone now too. 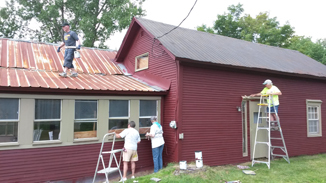 Early July saw the final painting of the Heaton House, including the trim and doors. Thanks to all the volunteers who pitched in. It looks great! Member Ted Bruckner did some touch up work on the base of the tower in August. He donated materials and his time for the effort. Thank you Ted. Pat Farmer and Scott Perry were finally able to get the clock running again and Kevin Scheffler has resumed his clock winding duties. The chime is still turned off. 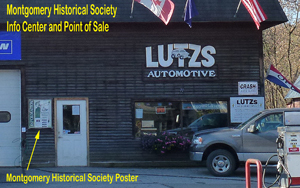 Copies of the 3rd Edition are available at Lutz's, The Town Office, at Pratt Hall and on line. We are still accepting engraved brick orders too. Pat Farmer has the details and you can also order via our web site. We've received a number of donations since the last newsletter. Our thanks to Gary Wetherbee for a picture album and papers related to our floods, to Henry Rowse for a bible and picture, to the Town for letters, and to Wendy Howard for pictures, papers (including a menu) and a T shirt related to Kilgore's Trout Saloon all in memory of Jim Abbott. A one pound T-bone steak with all the fixin's was $5.50. With a heavy heart we acknowledge the passing of Catherine Hays, wife of Past President, Board member, and leader of the "Concerts by the Common" series, Steve Hays. Catherine was Steve's right hand woman and will be missed. Our heartfelt condolences to Steve on his loss. October 1874 - Union Church re-consecrated after extensive renovations. November 1948 - Montgomery Grange #548 established. December 1977 - St. Bartholomew's renamed Pratt Hall in honor of Larry Pratt. 1. In a mid-1800s essay Nelson W. Clapp compares Montgomery’s topography to what household item? A tray with one corner broken out.